While documenting world’s most successful business enterprises, it is impossible to miss out on Starbucks, the company that defined the way the world consumes coffee now. Launched in Seattle’s historic Pike Place Market in 1971, the little coffeehouse named Starbucks has now grown to an upward of 25,000 stores around the globe. The company is the premier roaster and retailer of specialty coffee in the world. And this is not all. Starbucks in its journey to be among the world’s most admired companies not only served us those amazing cups of Joe, but also gave us – in form of the Chairman and CEO Howard Schultz – a leader to be inspired from. Repeatedly appearing at Harvard Business Review’s Best Performing CEOs List, Schultz again scored a spot at the latest list released in the November issue, only a few weeks before he announced his retirement. 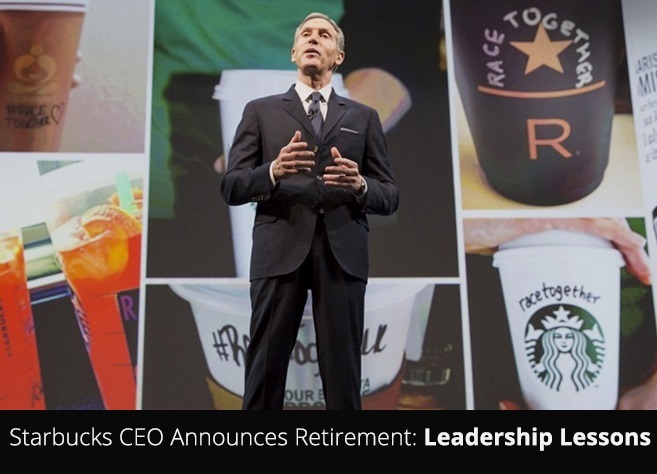 Now taking up the position of Starbucks Executive Chairman with focus on retail innovation, and currently at a personal net worth of $3.1 billion, this is Schultz’s second, and as emphasized, final retirement from the post of CEO Starbucks. In 2000, Schultz had left the CEO position after running the company since 1987. In early 2008 he returned to steer it through the financial crisis after the company lost half its value on the stock market over the course of a single year. Starbucks shares are up about fivefold since he returned as CEO in 2008. From a guy who grew up in a Brooklyn housing project and whose dad, a cloth-diaper delivery driver, fell on the job and had no insurance or salary; going to Northern Michigan University on a football scholarship and to be the first in his family to graduate from college, Howard Schultz’s journey makes him an embodiment of finest leadership lessons. Despite his interpretation of the world’s most ethical company‘s success in terms of numbers alone, what makes Schultz a unique example of successful leadership is his ability to inspire transformation. According to the Leadership theory formulated in 1978 by James Burns, there are two leaders, transactional and transformational. Transformational leaders inspire their team and encourage members to develop as individuals and be part of a collective team to work towards achieving objectives. This is the type of leader Howard Schultz has been, and that is what reflects in the numbers Starbucks puts across the board. Sometimes, you’re not prepared for the event but the event prepares you. I remember an assistant NBA coach telling me, “You can’t teach height.” The analog is you can’t teach heart. I love to surround myself with people who have heart and conscience. Values lay the perimeters of a business and it’s important for an organization to clearly define what it values. While performance is significant, adherence to values brings endurance to organizations and individuals. Much more than a plaque on the wall, values are represented in the policies and programs of an organization, how it expends its resources, what it rewards, and how employees behave. Schultz’s leadership has been a reflective of this. Starbucks has focus on profits while demonstrating value for its employees (healthcare, education, and diversity), communities (volunteerism and hiring of veterans), and the world (sustainability efforts). Starbucks does its best to remain true to its roots, but the company is also extremely innovative. Realizing that customers wanted to spend more time at its locations, Starbucks began offering free Wi-Fi in 2010. Foretelling that customers wanted its products at home, Starbucks has embraced instant coffee with the Via instant-coffee brand and single-serve brewing systems with its Verismo machines. The company has been the one of the first companies to go mobile with its own app. The development of the Starbucks Roastery and Reserve brand as the world’s most immersive, coffee-forward retail experience, is another exhibit of Starbucks innovative spirit. In the past several years, Starbucks acquired Teavana, created the Evolution Fruit product line, and placed a growing selection of products into grocery and big box stores. Starbucks has put in tremendous efforts in building billion dollars empire of brands through the stores that it operates, license agreements, and a growing consumer packaged goods (CPG) market. In a world brimming with inviting opportunities and attractive initiatives, an organization can be easily distracted, however, here lies the test of leadership to not make business a laundry list of things to be done. When accountants informed the company that it could save money by switching from two-ply to one-ply toilet paper, the idea was rejected. Starbucks felt that having one-ply toilet paper wouldn’t jibe with the brand’s image as “affordable luxury” and make a $4 cup of coffee hard to justify. Ensuring to sweat the small stuff, Schultz has remained committed to his turnaround strategy. In 2008-2009, the company was going through a business collapse and had lost its way. At that crucial time, Howard Schultz took 10,000 managers to New Orleans for a four-day conference to help inspire and challenge employees. All 10,000 left the conference on “a tidal wave of energy.” By 2013, Starbucks was reporting record profits. Building a legacy of responsible growth, and sustainable business model, Starbucks has actively invested in working on channels to know the mind of customers and employees – people, and to effectively respond. While the sustainability model is well gauged by the top 20% of Starbucks customers thriving on a Starbucks caffeine high and visiting a store at least 16 times per month, with its new set of 2020 goals, the company is all set to create even greater value expanding the global standard for green retail building and operations. Previous ArticleWhat drives us as companies and individuals to be creative?